Located southeast of the capital city San José, Tarrazú is known worldwide for producing some of the best tasting coffee. The area is so famous it's called “La Cuna del Café Costarricense"—the area where Costa Rican coffee was born. The coffee plants in this region grow in small valleys amongst Costa Rica's tallest mountain range, Talamanca. This is essential to the coffee quality because it provides a large amount of shade and improves the sustainability of the farms. The region's high altitude, number of sunlight hours received each day, and 2500 millimeters of rain each year also contribute to the development of the coffee plants. Tarrazú's economy revolves around coffee. Contrary to other regions where each coffee plantation is owned by a few producers, Tarrazú's land is owned by many small producers. They joined forces years ago to form cooperatives in order to help each other and seek uniformity in coffee quality. We work with one of the largest cooperatives in the region (over 3500 coffee producers), which encourages, researches and educates their producers on environmentally friendly growing practices. Our medium roast, allows the caramelized sugars to rise to the surface of the beans and highlight a chocolaty flavor with surprising hints of citrusy grapefruit. The resulting cup has a good body and a marked acidity with an overall flavor that is strong, unique, and delicious. Located southeast of the capital city San José, Tarrazú is known worldwide for producing some of the best tasting coffee. The area is so famous it's called “La Cuna del Café Costarricense"—the area where Costa Rican coffee was born. The coffee plants in this region grow in small valleys amongst Costa Rica's tallest mountain range, Talamanca. This is essential to the coffee quality because it provides a large amount of shade and improves the sustainability of the farms. The region's high altitude, number of sunlight hours received each day, and 2500 millimeters of rain each year also contribute to the development of the coffee plants. 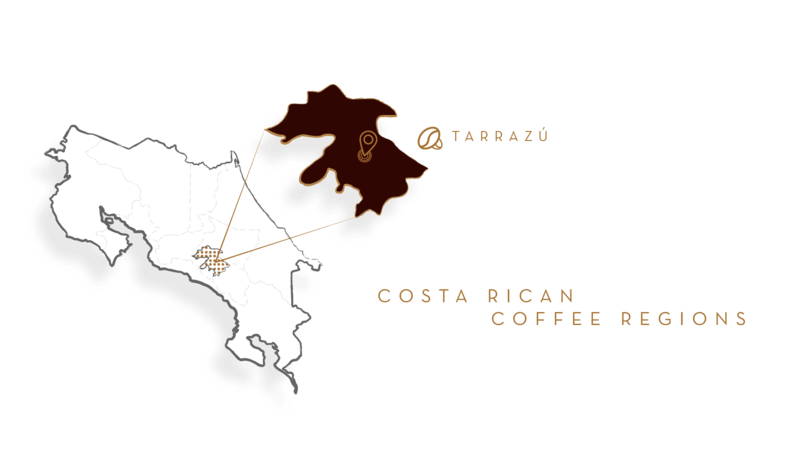 Tarrazú's economy revolves around coffee. Contrary to other regions where each coffee plantation is owned by a few producers, Tarrazú's land is owned by many small producers. They joined forces years ago to form cooperatives in order to help each other and seek uniformity in coffee quality. We work with one of the largest cooperatives in the region (over 3500 coffee producers), which encourages, researches and educates their producers on environmentally friendly growing practices. Our medium roast, allows the caramelized sugars to rise to the surface of the beans and highlight a chocolaty flavor with surprising hints of citrusy grapefruit. The resulting cup has a good body and a marked acidity with an overall flavor that is strong, unique, and delicious.